A rare opportunity to live in The Element! 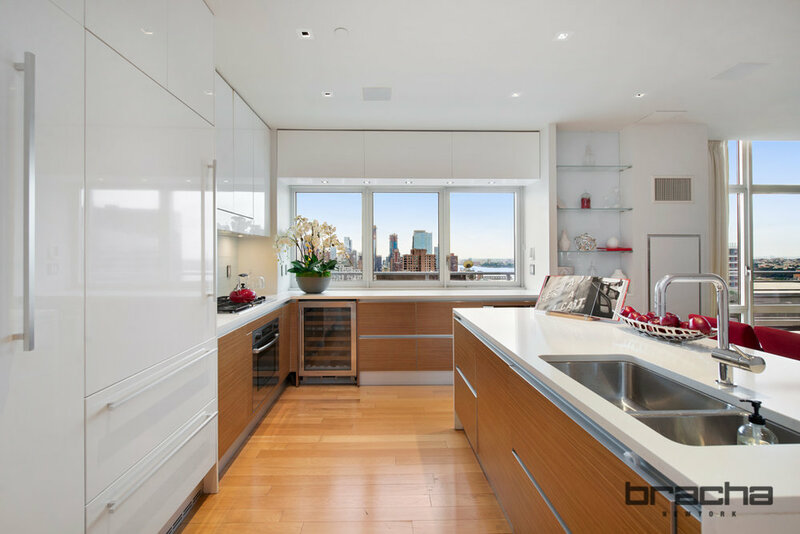 This 2,500-square-foot corner penthouse encompasses two floors of modern living space framed by floor-to-ceiling windows that offer sweeping views of the Hudson River and the city skyline. The airy, open floor plan is ideal for entertaining, showcasing tall ceilings, a sleek chef’s kitchen, floor-to-ceiling windows, and a private terrace with enough room to throw a cocktail party for up to 60 guests. Set on the top two floors of the 35-story glass tower, Penthouse B opens to a light-filled living area with wide-plank oak floors and an over-sized custom ethanol fireplace generously framed by gray stone and wood. The living space flows seamlessly into the dining area, which offers enough space for seating up to 12 guests. A large island with dual sinks and plenty of room for food preparation creates a natural border between the dining area and the sophisticated, all white kitchen, complete with white quartz countertops and white Poggenpohl cabinetry. Luxury appliances include a Sub Zero refrigerator, a wine refrigerator, and Bosch stove top, oven, and dishwasher. An intimate den/media room (or fourth bedroom) and a full bathroom complete the first floor. 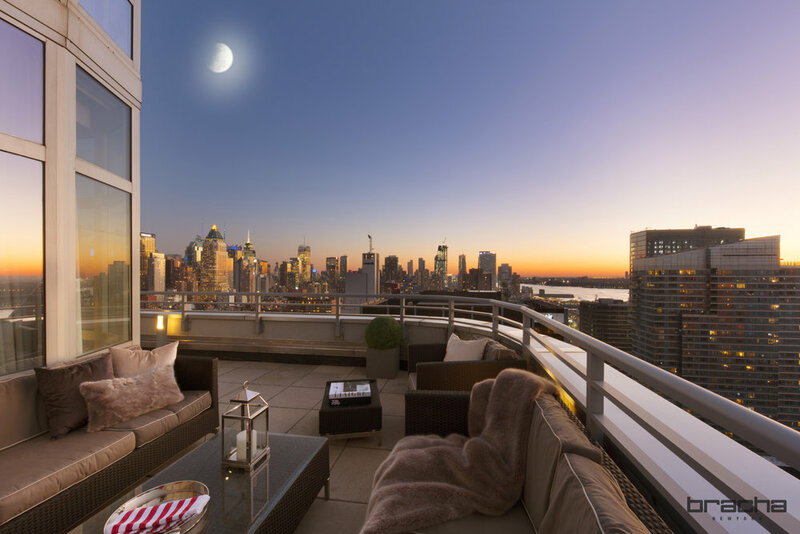 The wrap-around terrace has plenty of room for entertaining and relaxing and delivers unobstructed views of New York City landmarks including the Empire State building, the Intrepid Museum, and Via 57. From the living room, a curvy oak staircase bordered by glass ascends to the second level. The grand master bedroom delivers the feel of a spacious retreat, offering floor-to-ceiling windows, tray ceiling, a custom walk in closet and an en-suite bathroom with double windows, a deep-soaking tub, a double vanity, and a spa shower. The second level also holds two additional light-drenched bedrooms with floor-to-ceiling windows and custom storage as well as a laundry closet with a Bosch washer and dryer and a full bathroom with a double vanity. All bathrooms are outfitted with Waterworks hardware and lighting, audio, and temperature throughout the residence are adjusted via a Crestron control system. Designed by SLCE Architects and completed in 2008, the Element is a 35-story glass tower condominium that encompasses 186 condominium residences. Set on West 59th Street and West End Avenue, the building is located in Manhattan’s Lincoln Square neighborhood, part of the Upper West Side. Close to the amenities of Lincoln Center, Riverside Park, Columbus Circle, and Central Park, the Element is also within easy reach of several subway lines. On site the Element boasts white-glove service with a round-the-clock concierge, cold storage for grocery delivery, and an attended parking garage. The building’s spa comprises a 60-foot glass-walled three-lane swimming pool, a children’s pool, indoor basketball and squash courts, a yoga studio, massage treatment room, and fitness center. Other amenities include a resident’s lounge with billiards, flat-screen TV, and kitchen. The Element also has more than 12,000 square feet of outdoor space, including a great lawn, social lounge, sundeck, and outdoor playground that connects to an indoor children’s playroom.